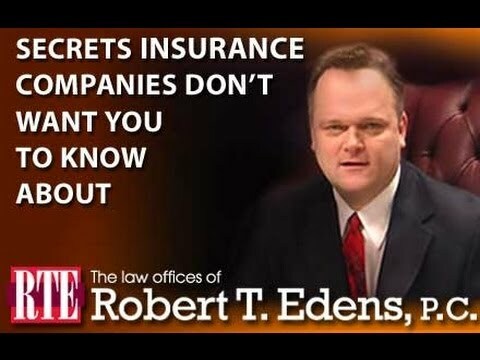 The Law Offices of Robert T. Edens has been fighting for the rights of injured workers for over 20 years. If you or someone you love has been injured on the job, take the time to look over this website and see for yourself why our law firm is the right firm to handle your workers’ compensation claim. We have video testimonials from numerous satisfied clients that claim we are the best. We have searchable verdicts and settlements that demonstrate the MILLIONS OF DOLLARS that our law firm has gotten for our clients. If you or someone you love has been injured on the job call Bob and put his 20+year of experience to work explaining the law and letting you know your options. During the initial evaluation Bob will take a detailed look at you case and let you know whether you need an attorney and exactly what he can do for you. The evaluation is FREE. You will not be pressured in any way to sign a contract. After hearing the details of your case, Bob and you can decide if you need an attorney, and if so, whether his law firm is right for you. THE CALL IS FREE, THE ADVICE CAN BE PRICELESS! 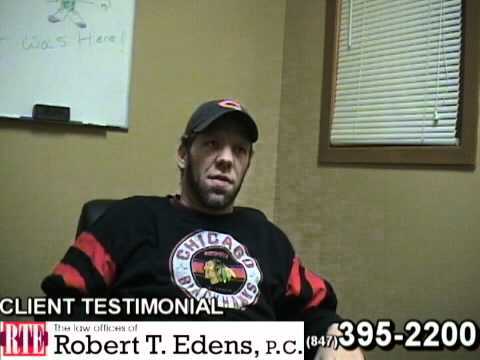 Robert Edens“Bob” is recognized as atop notch attorney that isready, willing and able to take even the most difficult cases all the wayto trial and appeals, if thats what it take to get his clients the money they deserve. 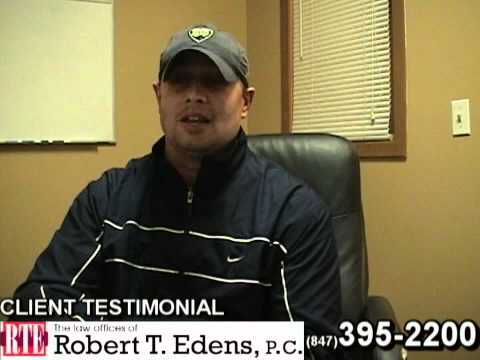 Bob’s law firm has two mottos they like to live by: (1) “We don’t claim we’re the best – OTHERS DO!” – (2) “Others practice law – WE’REPERFECTING OUR PRACTICE!” To see how others claim we are the best go to our TESTIMONIALS page and watch numerous videos of satisfied clients claiming that Robert Edens is the best attorney for your case. To see how we are perfecting the practice of law take the time to review just some of the 100′s of pages on this website. Each and every page was written by Bob and his assistant personnel. This is not a canned website, but a host of valuable information for current and prospective clients. It may not have all the glamor of the large law firms, but it shows how we have perfected our practice to provide our clients with TOP NOCHED and PERSONALIZED legal service in the fields of personal injury and workers’ compensation. Bob has been recognized as a top attorney in Illinois, has a top rating in AVVO. He isan active member of the Illinois Trial Lawyers Association, the American Trial Lawyers Association , and the Lake County Bar Association. In furtherance of his goal to provide the injured with top notch legal services, Bob has written three books to date. His first book was dedicated to personal injury in general. It also focused on the how insurance companies often use unscrupulous tactics to lower or deny the claims of personal injury victims. Because of his vast experience in the area, Bob’s focused his second book on dog bite injuries, a field that seems to be growing with the change in breeds and mishandling of dogs. Bob’s most recent book focuses on the the unique practice and field of Workers’ Compensation. All of Bob’s books are written in plane English and are designed to give the layman an insight into the various types of claims, how they are handled, and the issues that inevitably arise in each and every case. If you or someone you love has been injured, order Bob’s book, “12 Things You MUST Know About Your Workers’ Compensation Claim” If you have questions that aren’t answered below, visit the Bob’s Workers’ Compensation FAQ’s page. We can not emphasize enough the importance of getting legal advice in all but the most minor of cases. Remember, THE CALL IS FREE – THE ADVICE CAN BE PRICELESS! What to Expect if You are Injured on the Job and What You Must Know! WHAT ARE THE MOST COMMON WORK RELATED INJURIES? WHAT ARE THE BENEFITS UNDER THE WORKERS’ COMPENSATION ACT? DO I NEED TO HIRE AN ATTORNEY AND, IF SO, HOW DO I CHOOSE THE BEST ATTORNEY FOR MY CASE? WHAT ARE THE COMMON MYTHS AND MISCONCEPTION ABOUT WORKERS’ COMPENSATION LAW? 8 THINGS YOU NEED TO KNOW WHEN DEALING WITH THE INSURANCE COMPANY. WHAT CAN I EXPECT FROM THE INSURANCE CARRIER? Obviously the most common work related injuries will differ form industry to industry. However, below is a list of common work related injuries in no particular order. 1. Over-Exertion Injuries – The number one cause for workers’ compensation injuries is the overexertion of employee’s bodies. These injuries occur from heavy or excessive lifting, pulling, carrying, throwing, or pushing. 2. Slipping/Tripping – Many workplace accidents occur when employees trip over something or slip on materials left unattended. 3. Falling from Heights – These injuries can occur due to faulty equipment or falling off a ladder or scaffolding. 4. Reactive Injuries – A reaction by an employee to a situation, such as jumping out of the way of a falling object, or pulling back when startled, can cause muscle injuries & tears, body trauma, and a variety of other medical issues. 5. Falling Objects– These injuries occur when something falls from above and strikes a part of the body. 6. Walking Into Objects – As odd as this sounds, there are many reported injuries caused by employees walking into objects within their environment. Head, knee, ankle, neck, and foot injuries are common results of these walking type injuries. 7. Vehicle Accidents -Workers who drive as part of their job duties can be injured in an auto accident, some of which can be fatal. 8. Machinery Injuries – Workers using and working around heavy equipment and machinery are susceptible to getting caught in the moving parts of the device. 9. Repetitive Motion Injuries – Carpal tunnel syndrome is one of the most common injuries and is caused by the continuous, repeated motion used to perform ones job. 10. Violent Acts – These acts occur when an employee gets angry at his/her co-workers, management, or anyone they perceive as “wronging” them in some way. 1. Immediate Treatment: It is essential that an injured worker seek immediate treatment for their injuries. Ultimately, this can have great bearing on the outcome of your workers’ compensation claim. 2. Reporting: Illinois law requires that your injury be reported to your employer within 45 days from the date of the injury. The written report is done on a FORM 45. It is not always readily apparent that you have suffered an injury at the time of the accident, or the extent of your injuries, so the law allows sufficient time after the occurrence for any latent injuries to surface. 3. What and Who Determines if You Qualify For Workers’ Compensation? Any work related injury that prevents you from doing your full time duties for a prolonged period of time, as determined by your doctor(s), entitles you to medical and compensation benefits. Your employer can’t fire you or insist you return to work unless your doctor clears you to return to work, full-time, part-time or light duty. In many cases your doctor will put restrictions on the tasks you can perform. Examples include no lifting over 10 pounds, no bending, and no standing over one hour, to name a few. In these cases your employer may either find another job for you to do or tell you to stay at home until your restrictions are lifted. Problems in this area often arise. There are specific rules that apply, and if this is your situation, it would be wise to consult an attorney to discuss the specific details of your case. 4. Obligation to Your Employer: It is your responsibility to keep your employer apprised of your recovery and your anticipated return to work date. In almost all instances your employer will not allow you to return to work without documentation from your doctor stating that you are allowed to return to work and in what capacity. If the adjuster requests that you go to see their doctor for an “independent medical review,” you are required to comply. Understand, this medical review is anything but independent. It is an attempt by the adjuster to justify the discontinuance of your benefits and reduce the amount of your permanency award. If the adjuster requests that you go to such an exam, it is highly recommended that you consult an attorney beforehand. 1. Temporary Total Disability (TTD) Benefits: You are entitled to recover 2/3rds of your average weekly wage (AWW) during the entire time you are unable to work as a result of the work-related injury. 2. Medical Expenses: You are entitled to recover your medical expenses that have been incurred and that are reasonably certain to be incurred in the future as a result of the injury. You are entitled to choose your own doctor and go to any specialist he refers you to. The insurance company is required to pay for the specialist’s medical bills. 3. Permanent Partial Disability (PPD) Benefits: The injured employee is entitled to a percentage of disability for each body part injured up to the scheduled maximum at a rate of 60% of the average weekly wage, up to a maximum rate. 4. Other Benefits: In cases of serous injury or death there are other benefits which an employee and their family are entitled to receive. If you or someone you love is seriously injured at work, the best advice is to seek immediate medical attention and legal advice. Do I need an attorney and, if so how do I choose the best attorney for my case? Not every work related injury requires you to hire an attorney or even file an application with the Illinois Industrial Commission. In many cases injured workers only require a minimal amount of care and are back on the job in a short period of time. In these cases, there really is no need for an attorney and most often the Workers’ Compensation carrier will pay the medical bills and give the worker pay for the short time they are off work. However, in cases were the injuries are more serious, employees all to often make the mistake of believing that the insurance carrier, and the case worker that has been assigned to their case, have their best interests in mind. Remember, insurance companies are not in business to pay claims. If an injury is serious, the complexities of the claim and the determination of the benefits under the Workers’ Compensation Act becomes much more complicated. For this reason we highly recommend that at a minimum you consult with a skilled attorney. Rod was rear-ended while driving a company vehicle and stopped at an intersection. Suffering back injuries, Rod faced surgery with a lengthy recovery in which he needed to support his family. A friend recommended Bob. Despite a longer than usual settlement timeframe, Bob’s client was awarded nearly a million dollars for his injuries, loss of past, present and future earnings. Questions about the Statute of Limitations (SOL), what your case is worth, costs, mediation, jurisdiction, settlements, depositions and any other legal matters can be discussed directly with Bob, at no charge, by clicking here. If you prefer to make an appointment as soon as possible, please call 847-395-2200. 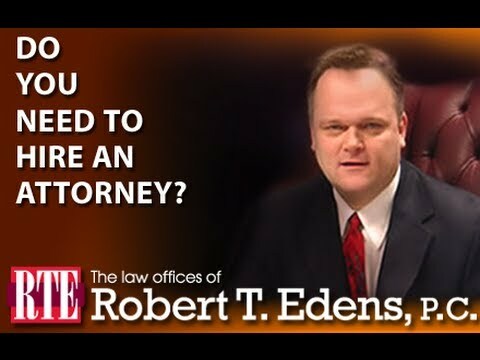 Robert Edens “Bob” would be happy to provide you with a FREE, NO obligation or pressure, evaluation of your case. Bob has over 20 years of experience fighting to protect the rights of injured workers. He will take a detailed look at the facts of your case and will explain your legal options. If you, or someone you know, has been injured at work call the Law Offices of Robert T. Edens, P.C. for your honest case evaluation. After a work injury your main objective is to get well and return to work. Illinois Workers’ Compensation cases can be very complex and can require a lot of time and effort to handle. Insurance adjusters, their attorneys and case managers are often rude to inexperienced individuals and wont answer questions or phone calls. This can get very frustrating. If this is the case we suggest you contact an attorney to discuss your rights. How will you know the right attorney for you and your case? Just a glance at the yellow pages or internet will show that all attorneys say they are the best or something to that effect. So how do you determine which is right for you? You need to get to the right lawyer and sort out the bad ones quickly. Often family or friends will suggest an attorney but be sure to check into the attorney’s background. I often get calls relating to people who need a divorce, bankruptcy, real estate or some other type of attorney. I specialize in Workers’ Compensation and personal injury ONLY. When I get these calls I refer the individual to an attorney that specializes in the field they require. To do otherwise is a disservice to the client. Yet, all to often I get calls from individuals that are having problems with the attorney they hired. After discussing who they hired, I ask if they looked into the law firm to see if they specialize in Workers’ Compensation cases. The answer is usually NO. Save yourself a lot of time and money and look into the law firm before you hire them. At the Law Office of Robert T. Edens, P.C. all we do is Workers’ Compensation and personal injury cases. We are a full service litigation firm that can take your case all the way to resolution, whether that is by settlement or full litigation. WE DON’T SAY WE’RE THE BEST, OTHERS DO! We strongly encourage you to go to our TESTIMONIALS page to see actual clients who were injured at work and hired us to handle their case. Dedication to excellence in the field of personal injury and workers’ compensation. Personal attention means going beyond the ordinary attorney-client relationship. It means personally knowing our clients and the details of their case. It means answering phone calls and questions when the client needs answers. At The Law Offices of Robert T. Edens, P.C. we understand the problems faced by our clients. What sets our firm apart from the others is the personal attention we give our clients from the very first time you come in the door. We go beyond the services offered by other firms. We will assist you in the selection of medical providers and much more. By the time your case is completed you will know why most of my clients become friends and continue to stay in touch and refer us cases for years. We are Prepared to Get You the MOST MONEY You Can Get for Your Injuries. In today’s world it is not enough for an attorney to know how to review medical record, file a demand/claim and expect to be able to maximize the money the client deserves. Today an attorney must know about a wide range of traumatic injuries, keep up to date with changing laws and know the players that are involved in the claims process on all sides. WOULD YOU WANT ANYONE LESS QUALIFIED REPRESENTING YOU? Our law firm has experience with details relating to causation analysis for the injury, the clinical examination for the injury, the various diagnostic test procedures for specific injuries, the underlying differential diagnosis of the injury and the prognosis for the injury. Bob and his staff have handled cases involving traumatic injuries to nearly every part of the body. The most common include severe brain injury and related head injuries, neck injuries, mid and low back injuries, shoulder injuries, knee injuries and ankle and foot injuries. Diagnostic testing for these injuries after a clinical evaluation range from simple X-rays to CT scans, MRI’s and more. Treatment for many of these injuries often starts with physical therapy and medications. If this doesn’t succeed in getting you back to work and your normal activities you may need further medical intervention including: epidural injections, trigger point injections, arthroscopic surgery, open surgery, long term pain management and more. Bob and his staff have handled cases involving most every injury and treatment that results from car accidents and work injuries. Bob has written the book that every injured worker MUST read to understand their rights and level the playing field with insurance companies and their case managers. Bob and his law firm have represented thousands of injured workers in the Lake County area and have obtained MILLIONS of dollars in settlements and verdicts for clients. We encourage you to take the time to go to our verdicts and settlements page and see the actual verdicts and settlements that we have gotten for our clients. 1. How will my medical bills get paid? 2. Will I get paid during the time I’m off from work and how much? 3. What happens if I can’t go back to my job because of my injuries? 4. Can my employer fire me if I file a Workers’ Compensation claim? At this time you can set an appointment for your FREE NO obligation and NO pressure honest evaluation of your case. Bob will personally look at the details of your case and put his 20+ years experience to work to let you know your options. What are the most common myths and misconception about Workers’ Compensation law? If you have been involved in a work-related injury you will only get one chance to get the compensation you deserve. Therefore, it is important that you separate fact from fiction. Myth 1: You can’t recover for your injuries because you were at fault. Truth: Even if your injury was your own fault you are still entitled to full benefits under the Workers’ Compensation Act. So long as your injury occurred at work, or in the course of performing your duties, and there were no special circumstances that would preclude recovery, you are entitled to certain benefits. Myth 2: You can’t recover because there are no witnesses to the accident. Truth:In many cases there won’t be any witnesses to your accident. However, that has little bearing on your ability to collect benefits. It is important to remember that it is your obligation to notify your employer as soon as possible about your injuries. Myth 3: You can’t recover damages because you are a new employee or your employer does not provide this coverage. Truth:This is a myth that some employers might like you to believe. The fact is your employer is required by law to carry workers’ compensation insurance and not doing so may result in fines and subject the employer to liability. Myth 4: You can’t recover because you didn’t go to the hospital or doctor right away. Truth:Injuries aren’t always immediately evident. An employee may feel fine immediately after the incident but a serious injury may develop later. It is best to immediately seek medical treatment for your injury. If you do not, it does not automatically prevent you from bringing a workers’ compensation claim for injuries caused by the accident. Myth 5: You can’t recover because your injuries relate to a “pre-existing” condition. Truth: A accident can often further injuries in an area that is already weakened by a prior condition. This is most common in back, shoulder, and knee injuries. An insurance company will try to use the fact that you received treatment to the same area to their advantage. For example: A person might have a previous shoulder injury, but as a result of this accident, they may now have a permanent injury and require surgery. An experienced attorney will have encountered this issue on many prior occasions and can aggressively challenge the insurance company’s allegations. Therefore, it is important to tell your physician, as well as your attorney, about any prior injuries as the insurance adjuster will eagerly argue that you were intentionally being deceptive to collect money for a pre-existing injury when you had no intention. Myth 6:You may not be able to return to work because you may be fired while you are out sick. Truth:Your employer can not terminate you from employment because you filed a Workers’ Compensation claim and MUST place you in a position at the same salary you were receiving at the time of your accident. 8 things you MUST know about insurance companies and why they matter! After your accident the insurance adjuster who calls is often pleasant, friendly, and will just want you to answer a few questions so they can help you. Customarily, they will tell you that your medical bills and lost wages are covered and may even offer to pay them as soon as you send them copies. However, often times once they receive the bills they will give you one reason or another why the claim cannot be paid or they can’t pay your lost wages. This is the first of many false promises and the first of many excuses you will hear. The goal is to get to a quick settlement and prevent you from retaining an attorney. Believing that you have to give a recorded statement. When it comes to recorded statements a good rule of thumb is “anything you say can and will be used against you.” Most people readily admit to their role in their on the job accident because they honestly believe that the insurance adjuster is sincerely trying to help them and understands that the nature of some jobs is dangerous. This is one of the biggest traps they hope you fall into. Once they have your version of events they can start building a case against you. You should not give a recorded statement. If Your Case has Been Assigned a Case Manager, they can Attend Your Medical Examinations. If your claim has been assigned a case manager it is likely that you were seriously injured enough to justify the insurance companies personal attention to limiting their exposure to loss on your case. The insurance company has a right to have a case manager follow your case. HOWEVER, the case manager may NOT go into the examination room with you and your doctor. They may attend your doctors appointment, but must wait outside to speak to your doctor after the examination is complete. They will be using the information gained from the doctor to determine if they should authorize additional treatment and whether you should be required to return to work and, if so, under what restriction. Often they use this information to decide on hiring their own doctor to refute the conclusions of your treating physician. Once you see their doctor, which they have a right to require you to do, you can bet that there will be a change in the treatment that is authorized, the requirement that you return to work and the benefits you receive. Their doctors work almost exclusively for insurance companies and are well paid to reduce the amount the insurance company has to pay in benefits. The Insurance Company Does Not Want You to Know the Type of Damages You Are Entitled To. (5) Wrongful death benefits to the family of the deceased worker. Insurance Companies Do Not Want You to Know, or Learn How to Find Out What Your Injuries are Actually Worth. Insurance companies go to great lengths to prevent you from learning how much your injuries are actually worth. The biggest way they do this is to try to prevent you from hiring an attorney. They know that once you do, statistics show you will receive two or three times as much for your injuries. Another way is not to inform you of the resources for valuing your claim. If you are dealing with an adjuster, ask them where you could go to value your claim. I bet they won’t direct you to the local Workers’ Compensation settlements and awards book. The Insurance Company Does Not Want You to Know the Long Term Consequences of Your Injuries. One reason insurance adjusters are often so eager to process a claim and offer a quick settlement is to prevent the victim from discovering the extent, and possible long lasting effects, of their injuries. Only you and your doctor can really answer this question and it usually takes time. On the other hand, the insurance companies use a “cookie cutter” technique to assign a value to each injury, or combination of injuries, and assess a dollar amount based on this formula. The Act does assign certain weeks of benefits for loss of limbs and has very specific guidelines. However, it is arrogant on the part of the insurance company, and insulting to you, when they attempt to classify all victims and their injuries into narrowly defined “one-size-fits-all” categories. You are unique, your injuries are unique, and you deserve individualized personal attention to every aspect of your case. The Insurance Company Does Not Want You to Know What a Third-Party Claim is or if One is Available to You. A third-party claim would involve a set of facts which could make a third-party, someone other than the insurance company’s client, responsible for your injuries. These claims often dramatically increase the value of your case. However, if you settle the claim without preserving the 3rd party claim, in some circumstances you may lose this opportunity. a. Accidents caused by faulty equipment or manufactured products. b. Injuries caused by an employee of another company at your job site. c. Injuries as a result of unsafe premises when owned or operated by someone other than your employer. d. Car accidents caused by someone else’s negligence when you are driving as part of your job. The Insurance Company Does Not Want You to Know That Accident Victims Receive 2-3 Times More Money With an Attorney. Victims represented by an attorney typically receive two to three times more money than they obtain when they represent themselves. Insurance companies don’t want you to know this. If you are dealing with an adjuster, ask him if they would advise you to speak to an attorney before proceeding any further. I bet you will hear a lot of things, but one thing you won’t hear is “yes, I suggest you seek legal counsel immediately.” This is why the insurance companies want to settle your claim quickly and why the adjuster will do everything possible to keep you from hiring a lawyer. What to expect during your during your Illinois Workers’ Compensation case. Will I be paid for the time I have lost from work? Will I be able to see the doctor of my choice or do I have to see a company doctor? Do I really need a lawyer to represent my case or can’t I just work this out with my boss? How will I know that the lawyer I’ve chosen to represent my case is the right lawyer for me and will he/she is strong willed and be able to fight for my rights? If I open a workers’ compensation claim will I lose my job? How will I feed my family in the meantime if I’m not able to work? If you currently have any of these concerns, then please read this page in its entirety, as well as the other pages that Bob and his staff have personally written, to help you get from the point that you were injured to the point you are back to work and receiving the settlement check in your hands. Bob has been a Workers’ Compensation lawyer for over 20 years defending the rights of people who were injured on the job. He has settled over a million dollars in Workers’ Compensation claims in the past five years. Over the past 20 years, Bob has encountered many people who have suffered from all types of work related injuries and failed to get the “right” legal advice. Some of these people haven’t gone to a lawyer because they didn’t know they have the right to compensation. Some people are intimidated by meeting with an attorney. They don’t want to file a workers’ compensation claim because they think that they might lose their job, their health insurance benefits, or the time they have put into the company, losing their pension. None of which are true!!! Each year, I hear of dozens of cases where injured workers who are entitled to receive compensation for injuries never took action to submit a claim to get what they truly deserve. In this day and age, doing nothing at all is one of the worst things you can do. Bob has a reputation of being a fighter, someone who looks out for the small guy. That’s why he has taken the time to sit down and write his book in plain English without a lot of legal technical jargon. It makes our firm sick to see hard working people who get injured on the job cheated out of what they rightfully deserve because they were intimidated by a big insurance company and were “SOLD” an unfair settlement simply because the company doctor said they really weren’t in bad shape. Or they were afraid of losing their job. It’s hard enough to make ends meet these days and getting injured on the job shouldn’t have to make matters worse. If you, or someone you love, has been injured on the job call Bob and put his 20+year of experience to work explaining the law and letting you know your legal options. During the initial evaluation Bob will take a detailed look at your case and let you know whether you need an attorney and exactly what he can do for you. The evaluation is FREE. You will not be pressured in any way to sign a contract. After hearing the details of your case, Bob and you can decide if you need an attorney, and if so, whether his law firm is right for you. THE CALL IS FREE, THE ADVICE CAN BE PRICELESS! It is important that you file your claim within the Statute of Limitations or you may be forever bared from recovering anything.